Yealink, the global leading provider of enterprise communication and collaboration solutions, and Far South Networks, a world-leading designer and manufacturer of IP telephony platforms, are pleased to announce today that Yealink’s new range of cordless DECT IP phones successfully completed the interoperability testing (IOT) with Far South Networks’ range of IP PBX products. The announcement highlights the two companies’ perfect product fit for SMEs, good prices, enterprise-class telephony services via cordless handsets, and a fixed mobile broadband connection. Yealink and Far South Networks first started their IOT collaboration in 2011 and continue their commitment to a close product partnership into 2019 and beyond. “We have successfully completed full featured, product interoperability testing between our range of Wanderbox and Com.X IP PBX products and Yealink’s latest range of quality DECT-based cordless IP phones,” said Grant Broomhall, MD of Far South Networks. Broomhall is particularly excited in the perfect product fit this “bundle” offers the small business sector. 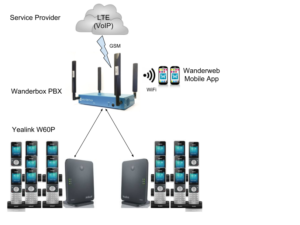 The simplified installation and set-up are due to the complete wireless nature of the equipment, as well as the products that feature interoperability. Minimal cables are required due to wireless interconnects, which includes DECT, WiFi and GSM/LTE. Far South Networks’ IP PBX range, including the Wanderbox and Wanderbox duo products, support up to 50 users offering a complete VOIP and UC&C solution, including wireless, LTE and WiFi, and wired broadband connectivity for the small to medium business. Com.X10 and Com.X20 PBX range support up to 450 and 1 000 user extensions respectively, and are equipped with VOIP connectivity and an all-in-one voice and data solution for enterprise businesses. All devices natively provide SIP interconnectivity with a range of legacy telecoms interfaces, including analogue, basic and primary rate ISDN. Yealink DECT-based cordless IP phone solutions include the W53P as a mid-level, market solution that is cost-effective, rugged and ergonomic, while the W60P provides a full featured, executive feel. The range is extended with the DECT USB dongle, DD10K, which turns the executive range desktop IP phones, T41S and T42S, into wireless devices. These handsets work seamlessly with the W60B base-station, supporting eight concurrent calls to eight handsets over a 50m indoors or 300m outdoor range.